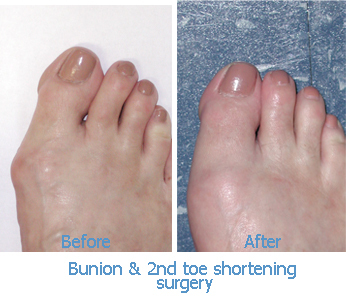 Dr. Lee specializes in performing the Cosmetic Bunion Surgery. See the difference when comparing his surgical results with the results from other surgeons. No wonder patients travel across the country and from outside the U.S. to experience this first hand. Restorative Foot Surgery™- A concept developed by Dr. Lee which combines the best of reconstructive foot surgery with plastic cosmetic surgery to bring you truly beautiful results. He believed that most surgeons corrected the mechanical function of the foot with surgery, but they neglected the cosmetic appeal by leaving unsightly scars or toe shapes and appearances. Influenced by his personal relationships with renown plastic surgeons in Southern California, he developed techniques and incisional approaches which allowed the full restoration of the feet while enhancing the physical appearance. It's a unique combination that one can only appreciated by seeing the before and after photos of his patients. Surveys show that most people are concerned about the way their feet look after a foot surgery. Many will undergo foot surgery and be left with large and/or unsightly scars, not realizing that their surgeons do not use Restorative Foot Surgery™ techniques (ability to concealing the incisions). Actual photos of a Non-Cosmetic foot surgery where the scars are visible. This is the technique used by virtually all foot surgeons. Actual photos of patients using Dr. Lee's Restorative Foot Surgery The 'After' photos are taken months after the healing period showing true final results. 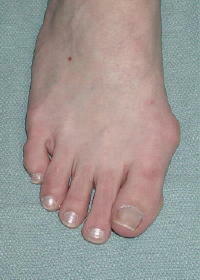 Bunions are a condition describing a noticeable bump at the base of the great toe. They can occur at any age from birth (congenital) through adulthood (acquired), but are more commonly a problem after the mid-thirties. Did I inherit this from my parent(s)? Yes...and No. You do inherit the type of feet your parent have, however, acquired bunions take time to develop through the years. If you didn't walk, wear certain shoes or injure yourself then you may not get bunions. 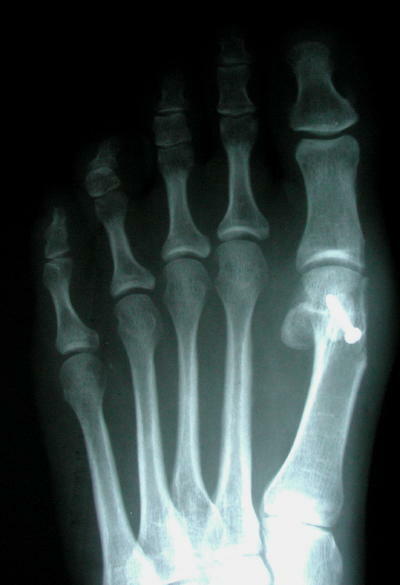 The formation of a bunion occurs as a result of a mechanical failure of the great toe joint to flex upward (dorsiflex). The ability of the joint to dorsiflex is related to whether the arch of the foot remains stable while standing and walking. If the arch does not support itself well during walking, then the joint becomes jammed or stiff. For normal walking (versus tip-toeing) to occur the toe MUST dorsiflex while walking (Side note: try walking without flexing your great toe). However, since it is difficult to naturally walk tip-toed the body compensates subconsciously by swinging the foot outward and walking around the stiff joint. When the foot functions this way for long periods of time the joint eventually buckles and the buckling effect causes the metatarsal to protrude forming a bunion at the base of the Great Toe. Normal walking: note great toe can bend upwards. Great Toe Joint Stiff: Foot swings to the side because toe cant' bend upwards. How do shoes affect bunions? Shoes cannot actually cause a bunion. People who have rarely worn shoes (barefeet or sandal) do get bunions because the true cause is abnormal mechanics of the toe joint. Shoes, though, may accelerate the formation of it and contribute to the painful consequences. The edge of a shoe, combined with the large bump, can put pressure on the nerve under the skin leading to sharp pain and inflammation of the area. This explains why wearing wider, larger or more accommodating shoes helps to relieve the pain of bunions. 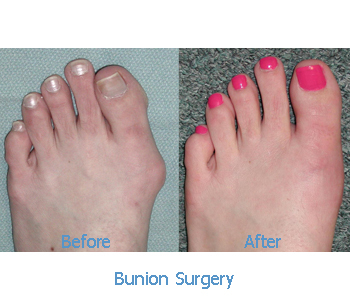 Deciding to Treat Your Bunion? The decision to treat a bunion depends on several concerns: level of pain, cosmetic appearance, physical or potential joint damage. Your decision to treat your bunion may depend on one or more of the following factors. Most individuals experience a portion of all of these issues. Level of Pain: Not all bunions are painful. However, if the bump becomes large enough the outside of the foot can become painful and aggravated by tight shoes. Many times pain will also be emanating from the inside of the joint as an additional symptom. This is a sign of joint degeneration (arthritis) due to abnormal friction from within the joint, a direct result of the joint jamming (see "What is it?"). Pain is the most common reason for addressing bunion treatment. Cosmetic Appearance: As the bump becomes larger the it becomes more unsightly and in some cases disfiguring. Physical Joint Damage: Recalling that the cause of acquired bunions is an abnormally functioning stiff joint damage inside the joint will eventually occur. This is called degenerative joint disease, commonly known as arthritis. DJD is a painful condition whenever the joint moves or is moved too much. Potential Joint Damage: In time, joint damage is inevitable during the formation of a bunion. 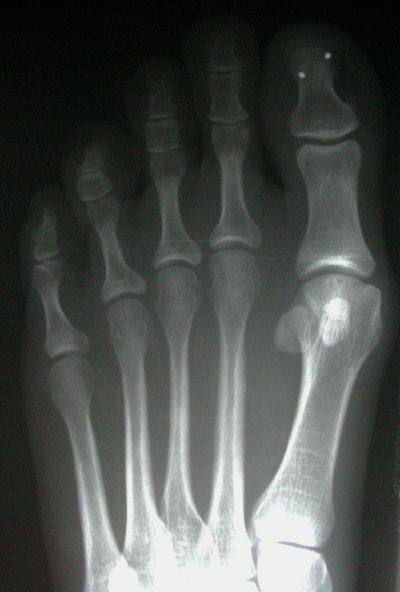 The rapid progression of a bunion and the specific mechanical character greatly influences the potential damage to the joint. With today's very active society, the consequence of an arthritic joint can lead to substantial lifestyle changes resultant from pain and disability. Many cases can be cited where the only obstruction for a 70 year old person to perform physical exercise is a bunion, yet they cannot undergo correction because of a medical condition prohibiting them from elective surgery. Therefore, it is important to weigh the total lifestyle impact of bunions before it's too late. Should You Treat a Bunion Conservatively or Surgically? This depends on how much the bunion bothers you (physically or cosmetically). Bunions can be painful. Bunions can make life difficult to continue with active lifestyles by causing pain or making it difficult to wear preferred shoes. Wear wider shoes or better fitting shoes. Have you shoe modified to accommodate your bunion. Place a pad over the prominent bump. Decrease your level of activity. Get prescription orthotics to return the joint back to normal function. Take pain medications (prescription or over-the-counter). Have the joint injected with cortisone if extremely inflamed and painful. Have the bunion surgically corrected. Technology is constantly advancing. However, don't be fooled! 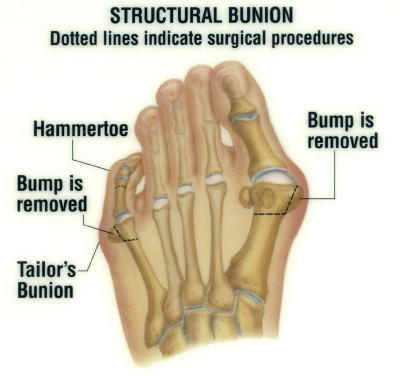 Laser cannot be used to reduce a bunion because bone is involved in the process of correcting a bunion. Current laser technology is not capable of cutting bone without damage to the bone itself. Once the decision that conservative measures are not the solution, surgical correction can represent a fulfilling experience. However, as a patient contemplating bunion surgery you are no given the task of the selecting the right surgeon. 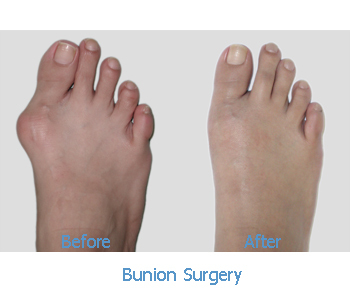 Bunion surgery is considered highly successful and proven for the reduction of pain and disfigurement. Thus many insurance companies cover this procedure. Notice the scars on top of the foot. 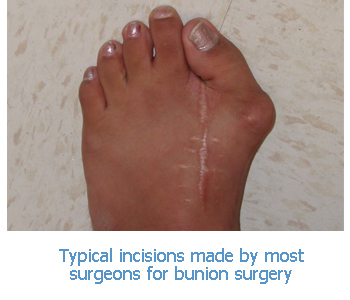 Most surgeons use the "top" of the foot (or dorsal) incision approach for bunion and hammertoe correction. 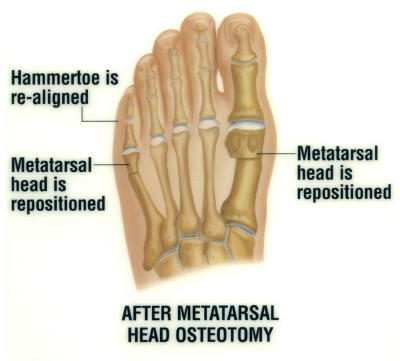 Dr. Lee utilizes a Restorative Foot Surgery™ technique which hides the scar from the top view. Note the absent of visible scars on the foot and the appropriate amount of angular correction. This results in a cosmetically appealing result as well as restoration of joint function. Surgical training and technique does vary considerably from surgeon to surgeon. A common question asked by patients is, "How do I know whether the doctor is doing the right thing?" Will I see the incision after the surgery? Are the stitches dissolvable or do they need to be removed? Does the screw or implant have to be removed later on? Cosmetic incisions involves hidden placement of incision, small gauge dissolvable sutures and use of low-injury techniques. Proper placement and technique should produce minimal scar visibility and size. The specific type of procedure should correct for joint mechanical malfunctions. Otherwise, jamming in the joint, slow return to activities and return of the bunion will occur. If possible, the surgical correction should allow early resumption of walking. However, if an extensive bunion correction is performed casting no no bearing of weight may be required. Is the surgical technique done under minimal injury and are there steps to ensure the post-operative pain is minimized? 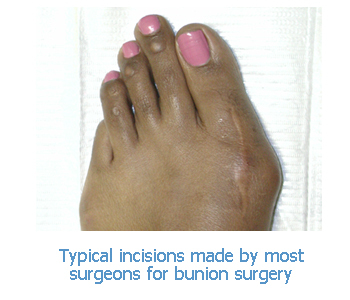 Dr. David Lee's bunion surgeries follow all these guidelines and considerations.